In CBS Kilkenny, all First Year students get the option of studying music for a three week taster module. At the end of first term, they get the option to pick this subject for Junior cycle. 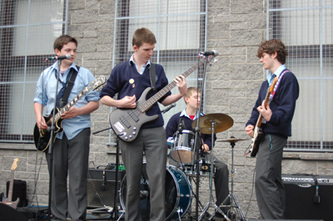 Music is offered as a subject from 2nd to 6th year and is also an integral part of the Transition Year programme. 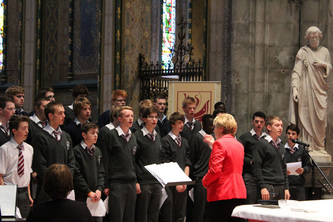 Choir is offered on the timetable in 1st and 2nd year and is also an option in Transition Year, 5th and 6th year. 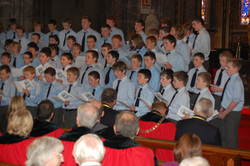 There is a Senior School Choir which is made up of students from 3rd to 6th year. Practice for this mainly takes place at lunchtime and after school. There is a CBS Jazz Band which rehearses outside of school time. We are in the early stages of re-establishing the CBS Pipe Band and at present, a number of junior students are learning the pipes with a retired member of the staff, during their music class. Various instrumental ensembles are brought together to perform at the many musical events taking place during the school year. There is one music teacher in the department. The accompanist for the choir also teaches on the staff. We have three teachers who come in to teach guitar, piano, saxophone and clarinet on a private basis. These lessons take place on Wednesday afternoons. 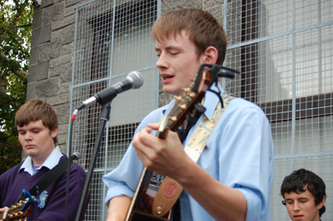 Performance is a very important part of the musical life of the school i.e. Kilkenny Music Festival, School Concerts, School Masses, Carol Services, various concerts and festivals. 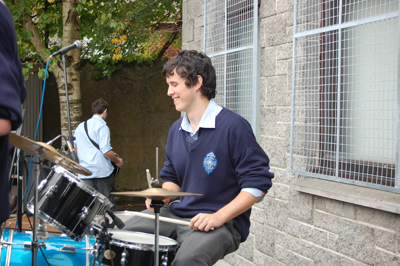 5th and 6th year students have one double and 3 single periods of music per week. All T.Y. students have one double period per weeks as part of an 8 week module. All students are encouraged to take the higher level course. 2nd and 3rd year music classes have one double and 2 single periods of music per week. All 1st year classes have one double period of music per week. The majority of students do Higher Level at Junior and Senior Level, with just a small number doing Ordinary Level. To encourage active participation and enjoyment of music. To develop skills in the areas of composition, performing and aural analysis, which will enhance the overall understanding and enjoyment of music. To include students from all musical backgrounds and with all different levels of skill and to encourage participation in the musical life of the school. To broaden musical horizons by exposing the students to a variety of musical genres, through active participation, listening, going to concerts and by inviting musical groups to the school. To provide instrumental tuition on an on going basis in the school, outside of the school hours. To develop many extra-curricular musical activities including, choir, jazz band, pipe-band and formation of instrumental groups. 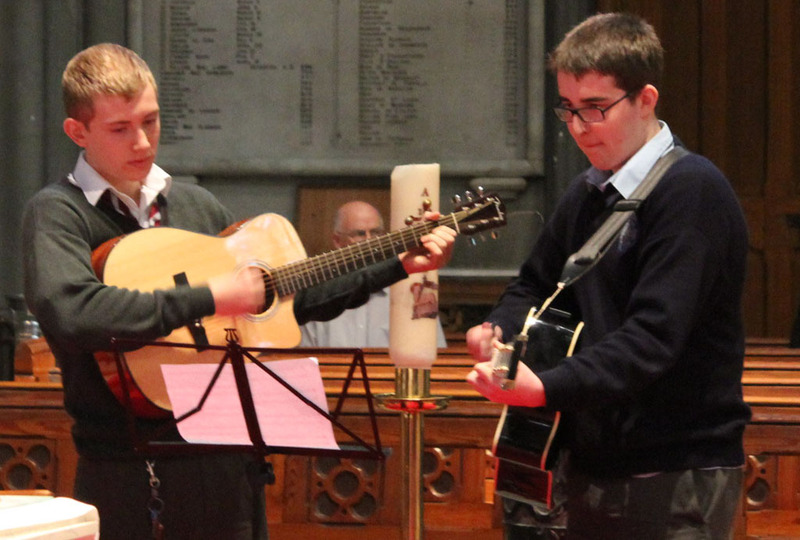 To participate in and prepare for school masses carol services, local choral competitions, school concerts, awards night and many different events. To encourage constructive use of leisure time. To develop an appreciation of music for life beyond school. To foster an interest in music as a career. To encourage teamwork and active participation. In addition to the school's sporting successes, CBS Kilkenny has always been very proud to have cultivated many of Kilkenny's finest young talents in music over the years, and now, for the first time, these talents have been committed to disc. The CD, entitled "The Voices of CBS Kilkenny", is host to an abundance of diverse music to suit any listener's tastes. From Eric Clapton to Ennio Morricone, from the Beatles to Bocelli, all of the school's choral ensembles are featured: the CBS Junior Choir, TY Choir, 5th Year Choir and Senior Choir, as well as performances from Ronan Doheny, Conor Brassil, The Octaves and a special rendition of Toto's "Africa" to mark the first CBS Kilkenny Zambian Immersion Project. The CD is available for sale in the school's front office for €10.